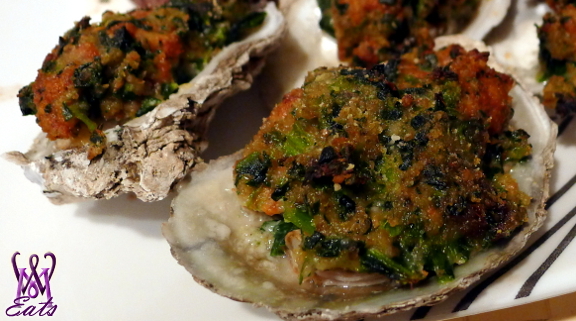 Oysters Rockefeller consists of oysters on the half-shell that have been topped with various other ingredients (often parsley and other green herbs, a rich butter sauce and bread crumbs) and are then baked or broiled. Named after John D. Rockefeller, the richest American at the time, Keith made a Greek spin on the fancy oysters dish one night using left over spinach and Feta cheese. Hence, I playfully named it Oysters Onassis after the prominent Greek magnate who married Jackie Kennedy in 1968. I figured the aristocratic reference could still work. Check out this classy appetizer on What Micky Eats...At Home. - Preheat oven to 425 degrees. - Squeeze the meat out of the sausage casing and brown in a pan. - Lower the heat, add breadcrumbs and mix together. - Add wine to give moisture. Mix thoroughly. - Spoon mixture on top of each oyster. - Bake for 15 minutes, until tops look brown and crispy. - Squeeze lemon wedges over each and serve immediately. *We did not have a special oyster knife, and Keith thought how hard it could be?! 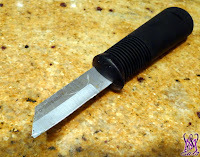 First, he used a regular paring knife to pry open the shell, but after a couple oysters the knife completely broke off! #fail He realized he needed a way stronger utensil and raided his tool box for something more heavy duty. He ended up using a flat head screw driver, which made opening each oyster way easier. I am not a fan of raw oysters. Keith loves to slurp the little guys down, but I just can't do it. 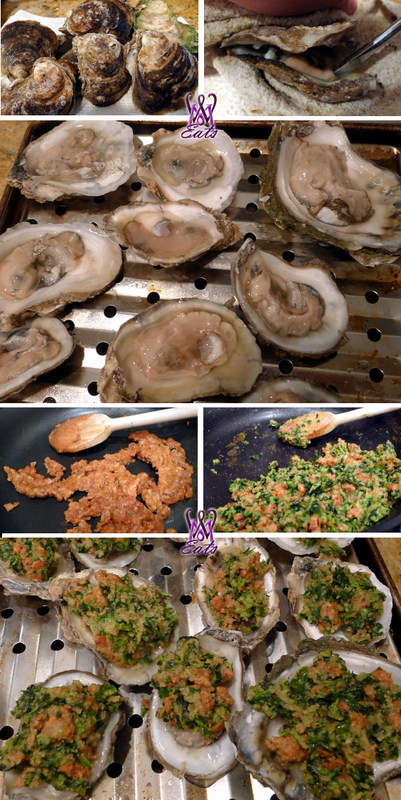 On the other hand, I do love oysters cooked - baked, fried, or broiled - they are delicious! I was worried that the strong Feta cheese might overpower the delicate oyster, but it didn't at all. 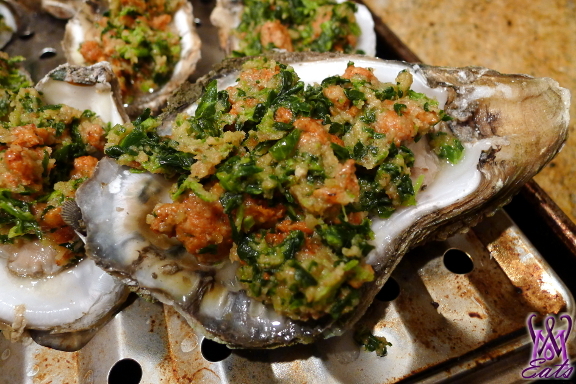 In fact, the mixture with the spinach and sausage was very tasty and filling, and complimented the creamy oyster perfectly. Plus, making this dish at home was way cheaper than ordering at a restaurant. Enjoy with a glass of your favorite wine and you'll feel like a socialite at your next dinner party!